As global supply chains continue to evolve into an ever flatting landscape the possibilities and the headaches continue to exponentially grow. Supply chain volatility in the market-place and the complexities in managing supply chain profitably become more perilous. Market dynamics, global supplier variances and seasonality trends continue to disrupt even the most stable supply chains. Market intelligence can change in a matter of minutes and the speed of market demands and customer expectations has become almost real-time, which is not a sustainable model for the current state of supply chains around the world. Something has to change. There is a revolution coming to the world of Supply Chain Management and logistics. It’s no longer enough to simply invest into best practices and hope for the best. With innovation comes change. Supply chain executives and managers that embrace that change will be positioned well for the new age in Supply Chain Connectivity. Information that was previously created by people will be increasingly automated and will become machine or system generated. Human error will go down and efficiencies across the supply chain will go up. Supply Chain data will flowing out of telematics networks, sensors, RFID tags, smart meters, GPS and more. Inventory will in the not so near future will count itself. Semi trailers and containers will be able to detect their own contents. Pallets will report in if they end up in the wrong place. Warehouses will automatically redistribute inventory between multiple locations to ensure additional and unnecessary capital isn’t spent on excess inventory levels from suppliers. The Internet of Things (IoT) is the idea that in which products and objects are enabled with the ability to transfer data over a network without requiring human-to-human or human-to-computer interaction. The “Internet of Things” is a technology revolution that is positioned to change the very way we interact with the world around us. The supply chain world will also be impacted. In the future, the entire supply chain will be online and connected — inventory parts, products, and other smart, “connected” objects will be integrated into the conversation to take the supply chain beyond just managing vendors, customers, suppliers and IT systems. Connected inventory will make way for the “connected supply chain” of the future. Systems tied to the cloud will lower the barrier of entry when it comes to integrating ERP’s, CRM’s, MRP’s and all other business critical systems. Connected inventory will bring all the supply chain stakeholders, products and customers into the business conversation. Supply chains will be much smarter and more intelligent. Advanced analytics and key performance indicator management will become the industry standard. Smarter systems will help decision makers evaluate alternatives at break neck speed, against an incredibly complex and dynamic set of risks and constraints to make more profitable decisions regarding the future of their supply chain. These smarter systems will even make some decisions automatically— increasing responsiveness and limiting the need for human intervention. Optimized systems will break down business silos in the supply chain to open doors for unheard of performance and profitably. 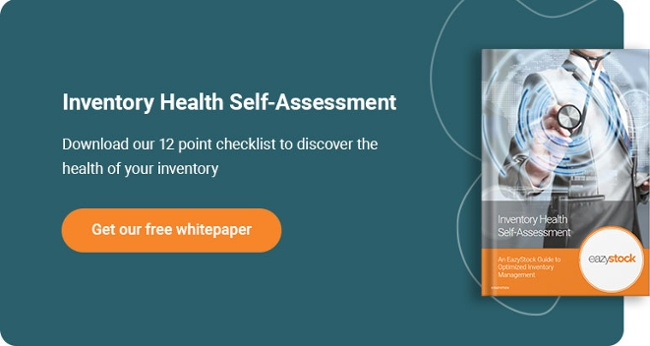 Take care of your business yourself by checking up on it – download your copy of the free “Inventory Health Self-Assessment” white paper to analyze your company and see what areas you can optimize!